Professor Colette received her bachelor’s degree in American Civilization from Brown University before moving to Minnesota to attend the University of Minnesota to achieve her MA and PhD in history. Her teaching areas include U.S. History with specialties in the 20th century, women and the role of food in world history. Professor Colette Hyman became a historian because of the first class in U.S. women’s history that she took in the spring of her sophomore year of college. Her senior thesis was on women in charitable organizations in the Gilded Age and the Progressive Era. By the time Colette Hyman got to her master’s thesis, she was fully in the Progressive Era, looking at the role of women in the massive strikes taking place in the first decades of the 20th century. For her doctoral dissertation, Professor Hyman stayed with the labor movement, but moved into the 1930s, a high-water mark for union activism and labor victories. This eventually developed into her first book, "Staging Strikes: Workers’ Theatre and the American Labor Movement in the 1930s" (1997). Since this research had taken Professor Hyman to archives all across the country, and along the way she had acquired a job and a family, she wanted her next project to keep her closer to home. What started out as a project about women in Winona became, ten years later, a book about Dakota women in Minnesota, South Dakota, and Nebraska: "Dakota Women’s Work: Creativity, Culture, & Exile," which made its debut at The Bookshelf in Downtown Winona, on April 3, 2012. 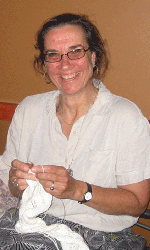 Working on a book about Native women’s fancywork inspired Colette Hyman to try her hand at some, and a fortuitous encounter with a new colleague in December 2006 set her on her path; she can now be found knitting most anywhere that doesn’t require her hands to be otherwise occupied! If Colette can’t be found anywhere else, you can be sure to find her at Yarnology, the local yarn store in downtown Winona!